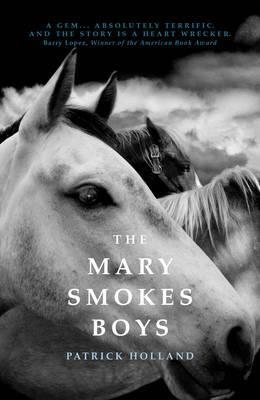 Jo Case speaks to Queensland writer Patrick Holland about his beautiful and arresting new novel, The Mary Smokes Boys. The town of Mary Smokes is a key character in the novel – it’s infused with such a rich, evocative sense of place. How important is place to your writing, and to this book in particular? It’s absolutely essential. Mary Smokes Creek is very real, though it’s 20 kilometres further north, as the crow flies, than the book has it. The town of the book is based on Esk in the Brisbane Valley and Roma, which is the town where I grew up. The creek in the novel is based on about a half dozen streams that I’ve built relationships with over the years. The landscape of the Brisbane Valley just triggered something in me. It seemed to exist independently of Brisbane, and indeed the rest of the world, while being geographically very close to the city. By this I mean that there were no fast food chains, not even any corporate petrol stations – all independents; the night sky was untroubled by electric lights; and, even today, the water that runs through the country is crystal clear and perfectly fresh, unlike an hour’s drive further east. Also, like the country where I grew up, the Brisbane Valley is capable of profound silence, empty space and darkness. These beautiful negatives are things we consume voraciously in cities, and I think we do so at a great loss. The above qualities had me regard the country of The Mary Smokes Boys as a kind of island, both in space and time. From the beginning of literature, the isolated places of the earth have been portrayed as crucibles for human emotions: we cannot deceive ourselves when there is nothing to distract us from the murmurings of our own souls and the silence of the cosmos. So in The Mary Smokes Boys the characters are always sitting by windows, looking up at the stars, staring across blowing grass and into the far hills. I think a character like Grey’s father seems even more defeated against this backdrop than would otherwise be the case. A man drinking a bottle of whisky in a single session seems, to me, more tragic and more existentially motivated when doing it at home and staring out a window onto grassland than he would in a bar surrounded by friends – he is a purer drunk, if I might put it so. Mary Smokes Boys is stalked by an often abstract sense of menace. You expertly build an escalating sense of dread from the opening pages, linked as much to the town, its landscape and the circumstance of its characters as any concrete threat. It reads as an impressive and engrossing exercise in Australian Gothic. Was this what you had in mind when you wrote it? I’ve certainly read and enjoyed examples of what might be called American Gothic – Flannery O’Connor, Faulkner and Cormac McCarthy, but to me, to write within the gothic genre would be to deliberately cull the light and amplify the dark to achieve a certain aesthetic effect. That wasn’t what I intended. I think there is some wry humour in the book. And the majority of the events narrated are real, hardly dressed up at all. All that’s made up is their chronology, their enactors and their relationship to each other. In that sense, the novel is the closest thing to a personal revelation I’ve ever written. I mean, I could drive you to the houses of illegal weapons dealers and cattle thieves out west. And the book’s murder was drawn from the murder of a little girl and friend of my sister in the town where we grew up, which event has stayed with me, as it would stay with anyone. The girl was killed in very similar circumstances and fashion to Irene in The Mary Smokes Boys – in the creek that ran at the back of my house, having walked home alone from school. I had been on that creek countless times in my life. Naturally, you wonder: ‘why wasn’t I there to stop it?’. I think the artistic impulse itself is the need to make sense of apparently chaotic events that at times give hints of being meaningful. In a sense, writing is a kind of prayer. You offer it up saying, ‘Is this what You meant? – Is this the truth?’. Your novel subtly interrogates ideas of Australian identity and belonging. The inhabitants of Mary Smokes include protagonist Grey, whose mother clung to her Irish heritage; his ‘half-caste’ best friend Eccleston; Eccleston’s adopted uncle Possum – who, though Aboriginal, is conspicuously not indigenous to the area; and Grey’s sort-of girlfriend Vanessa, an olive-skinned blonde, beautiful in ‘the ideal Australian fashion’. Were you actively wanting to explore these ideas – of what it is to be Australian, and to belong to a place? Certainly of what it means to belong to a place. The boys and Irene ‘Seek first the Kingdom’, they attempt to find and then keep a spiritual home. None of them have any great legal claim to the land they’re on. Grey’s father owns his house, but, given his pattern of behaviour, is likely to lose it in time. Eccleston’s father sold the boy’s land out from under him and escaped west, and Eccleston shows disdain for what a deed might still render him in burning his furniture to keep warm. This, of course, corresponds to the relationship the largely vanished aboriginal tribes of that country hold with the land – the Dall-a and Jinibarra, from which Eccleston is descended. A spiritual rather than legal bond, and finally an enforced exile. When I think about tradition and the novel, I think first of the mother’s book of Irish writing that Grey discovers and reads without comprehension, I believe it’s when Irene begins to read it one night, putting on an Irish accent, that Grey first has a vision of the girl and his mother being one. It is then he feels the fullest regret at not having learnt the Irish his mother wanted to teach him, so he might pass it on to Irene. Gaelic would have become an idioglossia the two of them could have shared, and, in a way, achieved Grey’s dream of isolating her from time, so he might possess her forever. Religion and belief are a running theme in Mary Smokes Boys, from the transplanted Catholicism of Grey’s mother and sister Irene; to the obscene new Christianity of Vanessa’s family church, with its ‘prosperous-looking travesty of Christ: his hair as well-kept as a banker’s’; to the locally rooted beliefs of Eccleston’s mother’s people, who baptised him in Mary Smokes Creek. Do you see these themes as important to the novel – if so, why? As you say, both the Irenes, elder and younger, are devoutly Catholic, and orthodox Christian spirituality certainly informs the novel. There is, I think, a pervasive sense of inherited guilt, a product of Original Sin. On the night he visits Vanessa at her house, Grey suggests the possibility that we are meant to suffer, that the sin is in us and it’s only a trick of time that means we have to wait to commit it. And when asked to declare his own faith, he claims his God is present late at night, in running water and with people in pain. I can only justify this characterisation by saying it reflects my own feelings. There is a darkness about his spirituality. Certainly, he feels a kind of hybrid guilt, both for having not been able to keep his mother from death and for the unnameable feelings he possesses for his sister. Irene herself embodies a kind of darkness, which, like physical and theological darkness, is both frightening and inviting: inviting in the sense that it asks us to travel beyond what is apparent and known, into deeper understanding. The novel, like all my recent writing, is concerned with what might be called, ‘The Divine Darkness’, a theological concept that occurs in the works of such authors as Pseudo-Dionysius, St John of the Cross and the metaphysical poet Henry Vaughn. St John of the Cross, of course, suggested that ‘the dark night of the soul’ must be breached before God can truly be found. Isaiah said the Messiah was to be light of the world, but he also wrote, ‘I will give you treasures of darkness and riches hidden in secret places, so that you may know that it is I, the Lord, the God of Israel, who call you by name’. As paradoxical as it sounds, I have faith in uncertainty, in shadows and broken lights. The self-assured intellectual despotism of any given Southern Baptist preacher proclaiming hellfire for homosexuals, or Richard Dawkins proclaiming much the same thing with different terminology for Christians and Muslims leaves me cold. I don’t know how my feelings on this relate to present-day theology. I wouldn’t presume to speak for Catholicism on guilt, though to me, this kind of Eastern Orthodox leaning spirituality is antidote to our age’s cult of personal happiness and the ‘you deserve it’ marketing we are subject to in the media. The city/country divide is central to Mary Smokes Boys. Small-town life is depicted as in decline and offering few opportunities – but also exerting the intrinsic lure of the natural environment, of home. To Grey, the city, which offers the promise of escape and reinvention, seems ‘an impossible place’. It’s also where ‘all young people’ inevitably move. How central is this divide to the book? Is it something that interests you personally? My chief concerns are with ‘home’ and discrete place, and how we’re losing them in the twenty-first century. The Brisbane Valley has been spared from becoming a far-western suburb of Brisbane by the D’Aguilar Range, which forms a natural boundary, though as time goes on and engineering becomes more sophisticated and there is more and more pressure on government to release land for development, that boundary is being disregarded, which is what gives that landscape of the novel a sense of ever-present threat. A commonly levied Biblical curse was that a man might die in a foreign land. There are aboriginal people for whom this curse would make perfect sense. But I think it would not have the same impact on many Australians. The trouble with the built environment of supermodernity, with its proliferation of non-places as opposed to anthropological places – deterritorialised, ahistorical structures like chain motels, fast food joints, cookie cutter estates that are alike in California, Jerusalem and the outskirts of Brisbane – is that we are less and less inclined to feel at home anywhere. The very notion of discrete place is compromised. So what threatens Mary Smokes Creek is not so much the city as the outskirts, the urban sprawl: a chaos, if I might express it so. You write starkly, movingly, about the alienated tribe of ‘wild boys’ of Mary Smokes and the surprisingly genuine, deeply loyal, community they find with each other. Despite the bleakness of the book’s events, the bonds of its characters are anything but bleak – they seem to reflect a quite generous view of human nature. Is that your view? I don’t think Man is basically good, but he hears a calling to be so. Call that impulse what you will, it counters the impulse to destruction and desecration. It takes vigilance, but I believe we can be more than our physical desires and our rationalism. If there is a code that the Mary Smokes boys live by, it is to attend to this calling at all times. Of course, this is not always a simple thing to do, as born out in Grey’s struggles toward the end of the novel, when he wonders if his jealous feelings toward his sister are destructive or otherwise. One intriguing aspect of the novel is the way local entrepreneur Tanner is drawn to the put-on glamour of the underworld and Queensland’s ‘moonlight state men’, while the more street-wise Grey and Eccleston see its banality. What interested you about this? Organised crime is so often glamorised in our media: in both journalistic reporting and fictional treatment. There are certain kinds of crime that interest me. For example, when individuals who are not essentially criminals commit crimes of passion, or do so for some necessity, like the theft of horses in The Mary Smokes Boys. I’m interested in the effects that breaking the social contract has on decent people. And I think there are times and places when a decent human being is called upon to break laws: the modern examples of Nelson Mandela and Gandhi suffice as proof. But to be in the crime business, I think, demands an infantile mind, else a sociopathic one. No one in that line of work can finally have any respect for himself or anyone else in the trade, as a professional criminal’s actions, depending on the breadth of his operations, potentially undermine every good thing in the world, even the things the criminal must consider good and desirable in the vast majority of circumstances: the sanctity of childhood, the respect due to women, the right to medical care, even the integrity of a fine wine or cup of coffee … All these things are achieved by honesty and hard work, while crime destroys them. Intrinsic to the book is a deep distrust of public institutions and authority. The local police are ‘all crooked’ and even seemingly benign institutions (such as hospitals) are threatening in their way. These characters are on their own in society, to fend for themselves. Does this reflect your view of the way our contemporary world operates, or is it the world of Mary Smokes? It’s perhaps just that the boys feel estranged from public institutions, because the material world is leaving them behind so quickly behind. My brother is a doctor, and I have nothing but the highest respect for medical vocations. As for police, I confess, it’s a little different. My first experience of policemen was of a police bashing, when a pair of officers beat up three ringers that were friends of my father. I was roughly ten years old. I remember being terrified and that my fingernails made permanent cuts in the door handle that I gripped in case the police came to reef me out of the car where I half hid. My mother ended up driving two of the boys back to hospital. One had a broken arm and the other had broken ribs and a punctured lung. In those days, and for boys like that, this was part of life. I’m well aware of the fact there are fine policeman in this country and that it’s often a tough and thankless job. But the truth is that police are not natural allies of small town boys like the Mary Smokes boys, and I would have been lying if I wrote it any other way. You write short stories as well as novels – you were selected for Best Australian Stories last year and have a collection due in November. Your writing in this novel is taut and spare – not a word wasted. Do you think this style and approach is influenced by your experience across the two forms? Do you have a preference for one form or the other? I’ve devoted myself to the practice of minimalism, both as a novelist and short story writer. And your intuition is right; the short form has certainly enabled me to focus on necessary techniques. I deliberately limit my palette: constrict my sentences to one adjective or adverb at most; keep descriptions to the presentation of a triad of concrete images that seem to best evoke the landscape or person I’m describing. In doing so, I attempt to create a kind of imaginative space for the reader to cross and so meet with the work on his or her own terms, rather than breaching that gap myself and laying sign posts. This narrative silence interests me greatly, and I explore it in both The Mary Smokes Boys and the upcoming collection of stories, The Source of the Sound. It’s related I think, to the silent and spacious places that are often my subject. Every word I write is carved out of silence, every image carved out of darkness. But this is just as true for a teenage television presenter as it is for me. The writer must respect this truth of language, never forgetting that each and every word calls up an existence out of chaos, just as the Orthodox believe the Word created the universe. The writer only mimics this creation, yet even this, I think, is a sacred duty. This precept, when held, dictates a minimalistic style. I can’t say I have a preference for either the short of long form. I slightly prefer short stories as a reader. As a writer, I enjoy the challenges offered by both. Who are some of your writing influences, or favourite books and authors? Who are you reading at the moment? My writers are Hemingway, Kipling, Juliana Horatia Ewing, Kawabata, Greene, Böll, Emily Bronte, Barry Lopez, Dante, Homer and the Biblical authors. These are the ones I read again and again, imbibing their rhythms, their lexicons, their tone. Hemingway’s rhythms are especially important for me: the variations within repetitions that he developed from Gertrude Stein are present in The Mary Smokes Boys. Kipling, for mine, is the most talented writer in the history of the English language. The late stories like ‘On the City Wall’ and ‘They’ made me realise that a story could be, in a sense, infinite … that even its author might not be able to bite down hard on its meaning. At the moment I’m re-reading a volume of war stories by Heinrich Böll, called Casualty. The descriptions of war in Eastern Europe are so vivid and vital that they make even many of Hemingway’s stories seem as though they might be written from second-hand accounts. When a writer can really ‘put you there’, as Böll can, we receive a precious gift of understanding and sympathy that no history book can achieve.